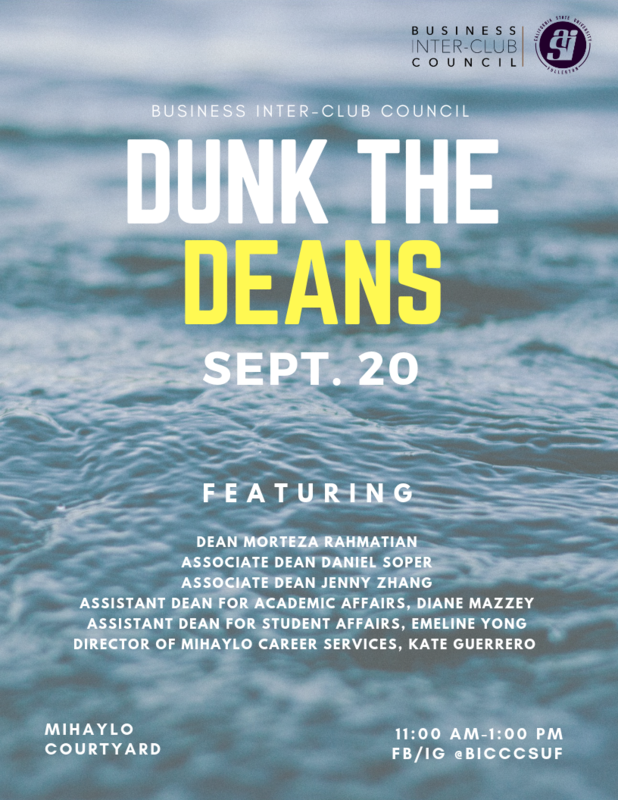 CSUF Mihaylo College senior leadership, the Business Inter-Club Council (BICC) and students of all concentrations will gather in the Mihaylo Courtyard this Thursday, Sept. 20, for Dunk the Deans, a free watery tribute to the lighthearted side of the college community. Beginning at 11 a.m., students will have the opportunity to ask questions of the deans and other college officials – along with the chance to dunk them in water in a format that is sure to make a splash! The event is a fundraiser for the college’s clubs, which facilitate engagement and networking for business students in a supportive environment. Participating panelists include Dean Morteza Rahmatian, Associate Deans Jenny Zhang and Daniel Soper, Assistant Dean for Academic Affairs Diane Mazzey, Assistant Dean for Student Affairs Emeline Yong, and Director of Mihaylo Career Services Kate Guerrero. In keeping with the theme, there will be coffee and donuts from who else but Dunkin’ Donuts! For more information on this or other opportunities for students to get engaged, visit the BICC online or at biccmarketing@fullerton.edu.